This is yet another product from Macmillan to be seen at the Cape Winelands Education District elearning conference/expo on Saturday, 9 March 2019, in Worcester. Having a lot of problems is, well, a problem. When it comes to Maths however, teachers will tell you that you can never have too many problems as practice makes perfect. Unfortunately, learners are often not motivated to practice Maths, as often they feel they will never grasp the concepts, or they don’t know where their knowledge gaps are. This leads to Maths teachers having to spend time on intervention strategies, or for parents to pay for expensive extra lessons which don’t necessarily provide the required direction – sometimes all learners do is solve problem after problem with the hope that they will eventually ‘get it’. 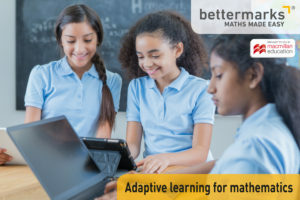 Enter Bettermarks®, a sharp online platform for Maths that employs very sophisticated technology in order for learners to access personalised learning. Bettermarks® takes adaptive learning to the next level – it is a truly personalised platform which is complimented by how easy it is to use by both teacher and learner. What makes Bettermarks® stand out is that learners get real time feedback at every stage, it gives specific feedback, and even gives the option to access the textbook if necessary. This turns mistakes into learning opportunities as it allows for errors in thinking to be diagnosed immediately, and then remedied, before a crucial test or exam. There are thousands of questions and the adaptive technology checks the thousands of competencies needed across the curriculum to flag any knowledge gaps, and then provides learners with further exercises to practice and master topics. Real time feedback and self-monitoring helps motivate learners and gives them confidence. Teachers can access learners’ results and progress via reports and then apply hands-on intervention if necessary – or assign further exercises via the platform. The platform will keep recommending exercises to learners to fill knowledge gaps until the teacher is assured the problem has been solved, and the teacher can then close the gap on the platform’s back-end. Teachers can use Bettermarks® in many different ways to help them monitor learner progress and difficulties, and to assist them in their progress. Features include the option of building worksheets from the question banks and distributing them to all learners – or individual learners – depending on the need. The questions can also be formulated into a test (which prevents tips and textbook access and is password protected). The platform marks all worksheets and tests automatically which saves the teacher a significant amount of time. One of the outstanding features is that Bettermarks® is developed to test learners’ skills in answering a Maths problem – not just multiple choice. Depending on the question, learners may have to divide blocks into fractions, draw graphs, or indicate points on a number line, amongst many other practical applications. The teacher dashboard gives a teacher a one screen overview of learners’ progress, and it also conveniently highlights areas in which all learners are struggling, thereby making whole class intervention strategies clear. This easy-to-use platform is a class act and a true asset to the classroom. Learners pay only R150 per calendar year subscription and teacher access is free with every class set purchased. Request a demo today by emailing za.digitalsupport@macmillaneducation.co.za or calling 011 731 3359. Waanneer jy die Kaapse Wynland Onderwys Distrik se e-leer konferensie op 9 Maart 2019 bywoon, maak gerus ‘n draai by die kamer van Macmillan, waar jy meer van Kliek kan leer. KLIEK is ’n splinternuwe gemengdeleer leermiddel nou beskikbaar vir gebruik in die Afrikaans Eerste Addisionele taal klaskamer. Die opwindende kursus is ontwerp om ’n liefde vir Afrikaans by leerders aan te wakker. Afrikaans word op ’n nuwe en vars manier aangebied deur digitale leerwerk, aktiwiteite en toetse – alles ondersteun deur ’n oorvleulende werkboek. KLIEK stel die onderwyser in staat om die klaskamer te omskep in ’n lewendige, gemengde leerarea. Die onderwyser besluit wanneer en hoe om die tegnologie binne en buite die klaskamer te gebruik. • Alle onderwerpe in die werkboek word ondersteun en aangevul met interaktiewe oefeninge, speletjies, animasie en toetse. • Terugvoering op verkeerde antwoorde verskyn onmiddellik en leerders leer uit hulle foute. • Leerders word beloon met toekennings vir deelname en goeie vordering. Hierdie benadering maak voorsiening vir ‘n generasie wat dadelik resultate en terugvoering wil hê. • Hierdie program maak ook voorsiening vir selfgedrewe leer- en probleemoplossing. Die leerder kan dus moeilike konsepte op hy/sy eie tyd bemeester. • Tegnologie is tweede natuur by Generasie-Z en wakker hulle entoesiasme aan, en daarom kan dit tot voordeel van die leerder, asook Afrikaans as skoolvak aangewend word. Elke verbruiker registreer vir ’n twee jaar toegang tot die platform. Talking Stories is an innovative South African reading programme that reflects real life situations in South Africa, affirming the sense of identity and dignity of every young reader. This product will be showcased by Macmillan Education on 9 March 2019 at the Cape Winelands elearning conference/expo. Talking Stories teaches children to love reading! 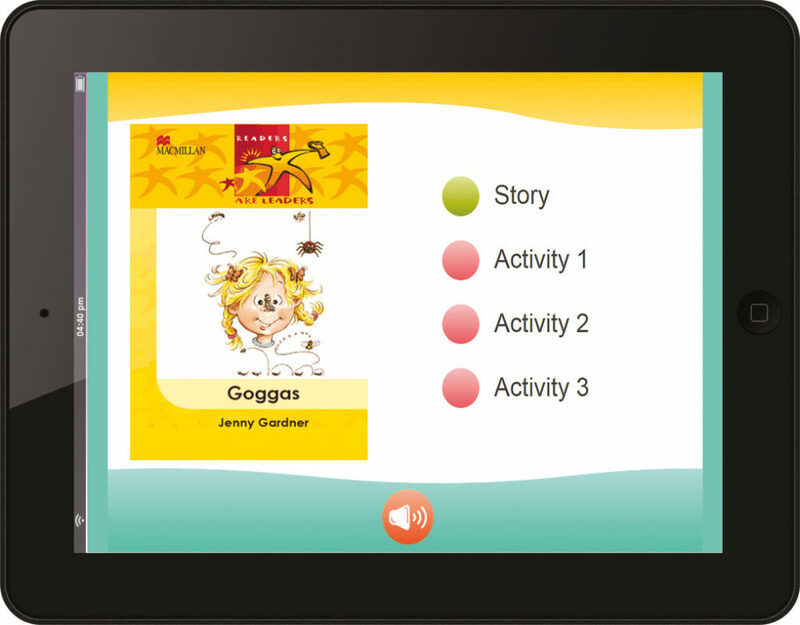 • Talking Stories can be used on a computer or interactive whiteboard, in the classroom, in the computer lab, on a tablet or on a cell phone. 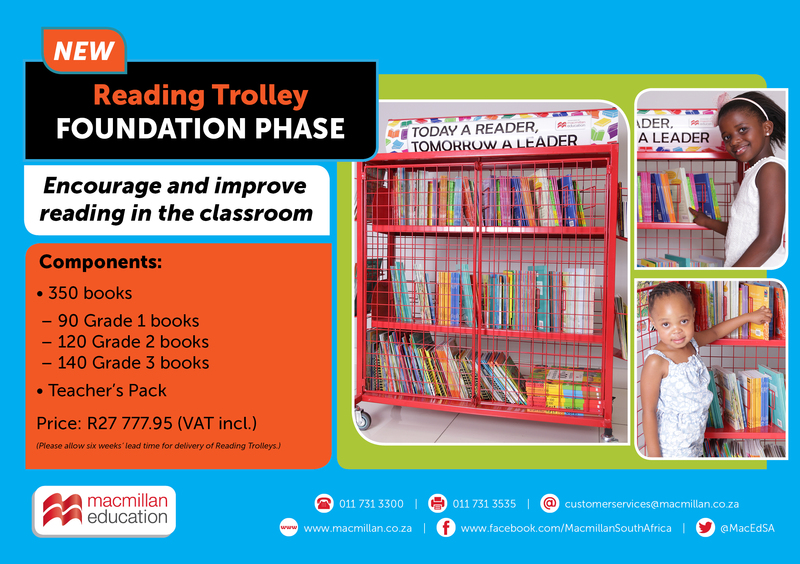 • 64 graded storybooks for levels 1 to 3 across a variety of genres in English, isiXhosa, Afrikaans and isiZulu. • Stories are graded for Beginner, Core, Intermediate and Advanced within each level. • Authentic South African stories with colourful illustrations to stimulate learners’ interests. • Every story comes with three fun interactive activities that draw on the content of the story. • The activities are aligned with the language curriculum. • The activities are designed to give the struggling learner a sense of completion of a task, while at the same time providing extension for the most able learner. • The activities feature ‘drag-and-drop’ answering and supported typing of the text. • Animated feedback encourages learners, giving them a sense of achievement. Printable worksheets related to each story are available for extra practice, homework, classroom activities or assessment. • Child-friendly design with easy navigation. • All instructions are sound-based. • Children listen to a story while following it on the screen, and can listen to the same page again if necessary. • In the lower level each word is highlighted as the child reads it. • Children are able to listen to the story in their home language first, to build understanding, and then switch to the language of learning and teaching. A Single User Licence consists of 64 graded storybooks for levels 1 to 3 in one language for one user. A Network Licence consists of 64 graded storybooks for levels 1 to 3 in one language for an entire school. Teaching and learning Afrikaans as a First Additional Language (FAL) can be quite a challenge. Learners are generally not motivated to engage with the subject and get bored with what is being taught as the language focus can seem quite repetitive year on year. In addition to this, today’s Generation Z learners have specific expectations on how they would like to be taught. Generation Z learners are true digital natives and are motivated by technology, instant feedback, fun and engaging activities, and rewards for progress. In addition, they want to be the navigators of their learning and engage with content in a way they’re comfortable with. In many ways the learners themselves have become disruptors to traditional education and one needs to teach ‘where they are at’ to get the required results. Enter KLIEK, an amazing, fresh, blended learning approach for teaching and learning Afrikaans FAL. To address 21st Century learning and teaching requirements, KLIEK has developed a fully integrated workbook and online platform approach which extends front of class teaching onto learners’ personal devices. KLIEK is designed to blend into the teachers’ style. Teachers present lessons using the workbook and online portal, and from there learners complete the book- and platform based interactive activities and tests. All digital activities collate with the book and make learning truly engaging. The animations and games are youthful in style and are all unique. As learners complete the fun activities they get immediate feedback on their progress and even get badges for effectively completing tasks. 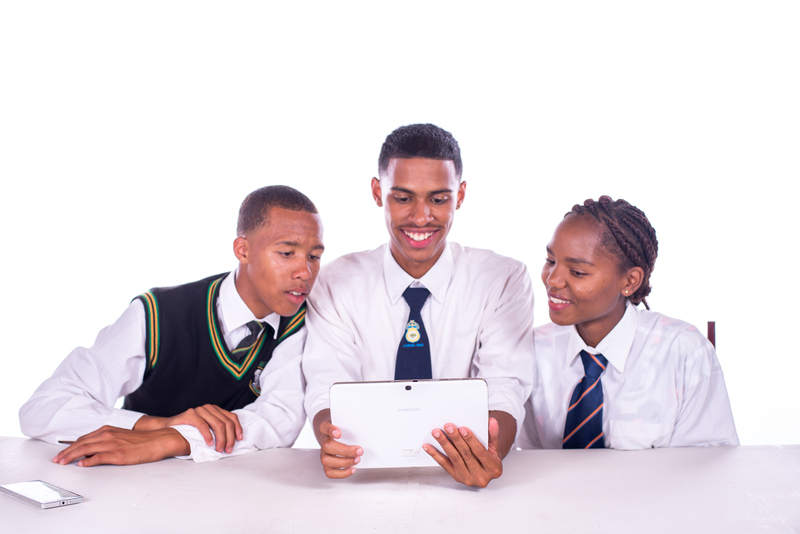 Through this programme, Afrikaans teachers can take the reins in technology-enabled learning geared towards results. The portal also contains much additional study work and examples related to each language concept. For teachers there is also a fully integrated feedback tool which allows teachers to assess learners’ progress and areas of required development. KLIEK’s blended learning approach has been developed by a dynamic teacher and developer team to specifically engage and motivate Generation Z learners while meeting curriculum requirements. Learners that are currently using the programme greatly enjoy the variety. There is a clear and measurable improvement in not only their marks but also their attitude towards learning Afrikaans. KLIEK can be applied from Grades 6 – 12 and can be integrated at any point in a learner’s schooling. It will convert the Afrikaans classroom into a Digital Learning Hub. For more information, or to request a demonstration at your school, please contact the KLIEK distributors Macmillan Education at 011 731 3359 or za.digitalsupport@macmillaneducation.co.za. 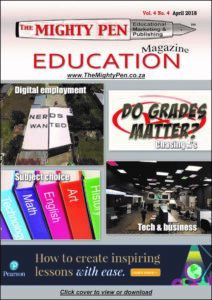 As usual, an interesting array of articles is available in the latest issue of The Mighty Pen. It is good to see the presence of a few ADESSA partners in this issue: EduWeek, Macmillan and Sangari. It will be great if more of our members can contact The Mighty Pen to advertise or to provide relevant content to this great educational magazine. The number of children with access to the internet continues to grow worldwide. Cybersafety is a growing concern for both children and adults. Macmillan Teacher Campus will be hosting a workshop that will make educators aware of the dangers and guide them in teaching learners about cybersafety in a fun and exciting way. Be able to advise parents and learners about posting safely on social networking sites.